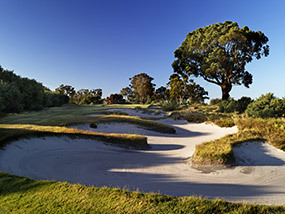 The Kingston Heath Golf Club is a private members club. Visitors from Interstate or Overseas are welcome during certain periods of the week. Such visitors will need to be members of a recognised golf club, with a current membership identification card or a letter of introduction from the home club. Contact Planet Golf for assistance with tee times. Shortly after World War I, prominent Melbourne solicitor Stanley Dutton Green led a committee of disgruntled city golfers on a search to acquire sufficient land within the growing Melbourne Sandbelt to construct their own championship golf course. Their search for the ideal site brought them south to Cheltenham and a small gently undulating parcel of land that was soon purchased to become the home of the Kingston Heath Golf Club. Fascinated by British design, Green corresponded with Open champions J.H. Taylor and Harry Vardon, who convinced him that with the advent of the rubber-cored ball, the new course should be built of a length to ‘stand the test of time’. The committee agreed and called in Sydney professional Dan Soutar to design the layout. Soutar walked the property twice without comment before coming to rest amidst dense scrub near the center of the site and declaring ‘here is where we start, an ideal ready made short hole for the 10th.’ He later changed the direction of the 10th hole, but continued to plan the entire course from this point and when finished had met the club’s brief and created what was officially the longest course in Australia. Measuring a little over 6,200 meters when first opened, the fairways, tees and greens were built by Royal Melbourne superintendent Mick Morcom in 1925 while the bunkering was deferred on news of the imminent arrival of famed architect Dr Alister MacKenzie to design Royal Melbourne West. 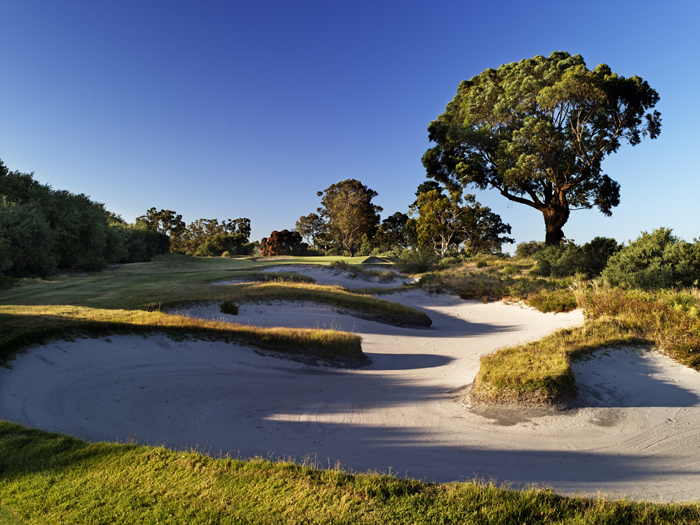 MacKenzie provided a detailed report on the bunkering of each hole at Kingston Heath and also felt compelled to suggest one important change to the overall course design, converting the blind par four 15th hole into an ingenious uphill par three. MacKenzie clearly thought highly of Soutar’s routing and the fact that he could find just one design fault was in itself a glowing endorsement of his layout. It is interesting to note that the designer was paid £25 for his tireless work while the club reluctantly paid MacKenzie ten times that amount for bunkering plans that he finished in a matter of days. Though seemingly inequitable, the club was left with one of the country’s great par threes and possibly the best bunkering system in the world. Kingston Heath’s entire collection of short holes is outstanding, the signature 15th is the star attraction but the beautifully bunkered 5th and the treacherous 10th are just as impressive. Of the remaining holes, strong par fours like the 1st, 6th, 8th, 9th, 11th and 16th standout as do each of the par fives and a number of fascinating semi-blind shots. Perhaps the best hole of all, though, is the driveable but dangerous 3rd, which features a shallow green that is angled to accept only the most precise pitch shots. Although most of the Soutar/Morcom course remains in play, long standing superintendent Graeme Grant did make some alterations during his tenure. These included the rebuilding of several greens, the addition of a deep depression protecting the front of the par five 7th and the controversial, and less successful, central bunker on the wonderful 11th hole. The putting surfaces, especially those Grant reshaped, are superb and it would be hard to argue that the greens on any classic course, other than perhaps Royal Melbourne, are better than the Heath’s. With the exception of dense tea-tree and heavy undergrowth that was badly burnt out following a major wild fire in 1944, the natural process of the course’s evolution has gone relatively smoothly. Some overplanting problems have been corrected and the vast areas of low growing Heath grasses, which give the course its unique character, are now thriving after a recent restoration. Aside from brilliant bunkering, wonderful greens and incredible construction, the Heath’s charm lies in the use of these native grasses and the manner in which the holes and hazards seamlessly integrate into the surrounding vegetation. A special privilege to play and one of the finest examples of golf course architecture from any era, Kingston Heath’s greatest defense from low scoring continues to be a strategic layout that is playable to all yet demands absolute precision from the professional wanting to score birdies. Though it no longer plays like the monster it once was, the combination of an ageless design and stupendous bunkering has helped the course remain a supreme test of one’s golfing smarts.